I remember having the opportunity in Middle School to attend a Career Day presentation given by my dad. Something he said during that presentation has stuck with me since that day in seventh grade. “If you love your job, you will never work a day in your life.” I find this interesting and inspiring because there is a direct correlation between job satisfaction and life satisfaction. It is important that people find enjoyment in what they do because the majority of their lives will be spent working. During the school year I have two jobs: I am a full-time student and a Resident Assistant on campus. This is currently my third year as an RA and I really love the position. 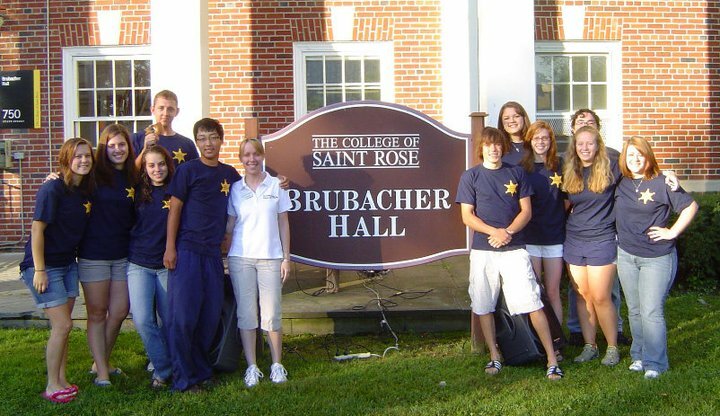 My first year, I was fortunate to work with a really great group of freshmen girls in Brubacher Hall. Living in the freshmen dorm was demanding; I would have multiple incident reports to write every time I was on duty and residents were always coming to my room to talk about things going on in their lives. Because of the time commitment and mentally challenging situations, I really believe that if I had not loved it, I would not have been able to handle the position that first year. Pictured above is the staff I was a part of my first year as an RA. 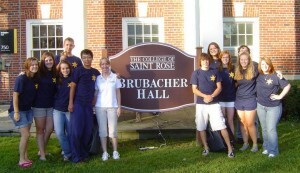 The picture was taken the morning of freshman move-in day. 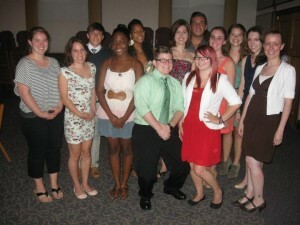 Last year, I was the Resident Assistant of Kelly Hall. Once again, I was fortunate to have great residents. I really enjoyed living and working in an upperclassmen house. This year, I am one of two RAs in Alumni Hall. Right now, I have more residents than I had my first two years combined! While I have upperclassmen again this year, it’s the first time that I have co-ed residents. It is an entirely new experience having male residents! I’m lucky though to be a part of a supportive staff (pictured at right). Between training sessions, staff meetings, and miscellaneous staff bonding, RAs spend a lot of time together during the year. The job is a lot more fun when you’re a part of a strong staff. I strongly encourage students to consider being an RA. It is a huge time commitment, but also a rewarding position if you work hard and find enjoyment. Currently, the Fall 2012 RA Selection Process is going on. Students apply, interview individually, and participate in a group day interview in the hopes of being hired as a mid-year RA. While this is a stressful time for applicants, I’m hoping that it will also be an exciting time for them. Good luck to everyone that is currently in the process of applying! And to everyone else, take some time to consider if this might be a job that you’d love! Hope everyone has a great long weekend! As always, thanks for reading!